Wow, this month has just flitted by so quickly. It seems like it was just yesterday that I posted my first card for the month as the Guest Designer for Word Art Wednesday. Would you believe that was five Wednesdays ago? I'm sorry to see this month end. I have really enjoyed my time as GDT here. The Scripture verse for this week is James 3:27. You are free to use this verse on a card, although you don't have to. I always think that if they are providing the image, it should be used. But's that just MHO. I pulled a few pieces of cardstock out of my scraps of paper until I found some that worked together.. I thought the dp looked pretty good with the pale yellow and brown. With the gloomy days of winter, it looks a little cheery. I cut the sentiment panel and mat with my Cameo. I sponged the sentiment panel with distress ink. The flowers are unknown from my stash. Bling is Want2scrap and colored with Copics. Well Peeps, here we are at the very last day of the year. Where did 2014 go? It seems like it was just the beginning of the year. Do you make resolutions? I gave that up years ago when I had broken all my resolutions in the first week. LOL. So now, I just take it a day at a time. Ok, to get to the reason for this post. 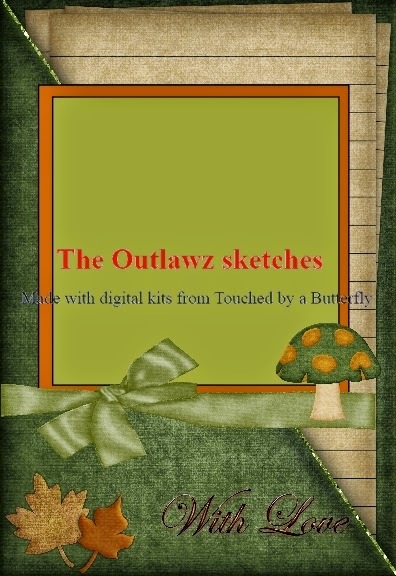 It's Wednesday so it is time for The Outlawz Sketch Challenge. I really liked the sketch this week. It was an easy one for a very busy time. Our sponsor for the last time this year is Ching Chou Kuik. I have used Garden Daisy Fairy again for my card. As usual, I colored it with Copics. I printed the background paper called "Plastered" from Digi Stamp Dreams. It really looks textured. I cut the middle piece with a Martha Stewart punch. The butterflies are also from a Martha Stewart punch. The scalloped oval was cut with my Silhouette Cameo. I sponged the edges with distress ink. I have recently found progressive challenges. I think I like them. You make one card a month using the challenge provided by the company. Then after you enter you card, you automatically receive the free image for the next month's challenge. This progressive challenge is sponsored by From The Heart Stamps. This little guy is called Christmas Spirit Birdbrain. I used digi paper by Bearly Mine Designs and scraps from my scrap bin. I colored him with Copic markers. The gold paper is colored with Wink of Stella Gold Glitter Pen. Merry Christmas Peeps. I won't be online tomorrow so I'm sending this wish to you early. The challenge at DigiStamps4Joy this week is going to run for three weeks, until January 13, 2015. That way you have plenty of time to take a few minutes for yourself and whip up a project to share with us. Karin is hosting this challenge and has chosen "Add Glitter -Lots of It" for her theme. I chose to use Misteri's Music (pre-colored) for my card. You can find this image, both outline and colored, in the DS4J store. For this card, I used a 5.5 inch square card base. I dry embossed the bottom layer with Floral Frenzy 6x6 Die'sire embossing folder. I put Ice Blue Stickles over the raised parts of the embossing. For the die cut, I used Spellbinders Victorian Medallion Three die with DCWV Glitzy Glitter cardstock. I also used Ice Blue Stickles to highlight the pleats in the dress on the image. The flower is from REcollections Floral Embellishments with some more Ice Blue Stickles on the petals. The bling in the flower center was from my stash. I deliberately photographed the card at an angle so the glitter would stand out more. Twas the day before Christmas and all through the house . . . Well, everybody is stirring getting ready for the big day tomorrow. I almost forgot to post this card. Okay, I'll take a deep breath . . . The image is "Scarlet Lips" from our sponsor for December, Ching Chou Kuik. The big day is almost here. I wish each and every one of my Peeps the merriest Christmas ever. The theme for The Crafter's Café today is a CAS Christmas Tag. Fred She Said is our sponsor for this challenge. I used a precolored image called "Emma & the Snowball." There was very little I had to do for this tag. I printed and cut the tag with the image grouped onto it with my Cameo. I then sponged Tim Holtz Salty Ocean Distress Ink around the edges and also on the white ribbon. 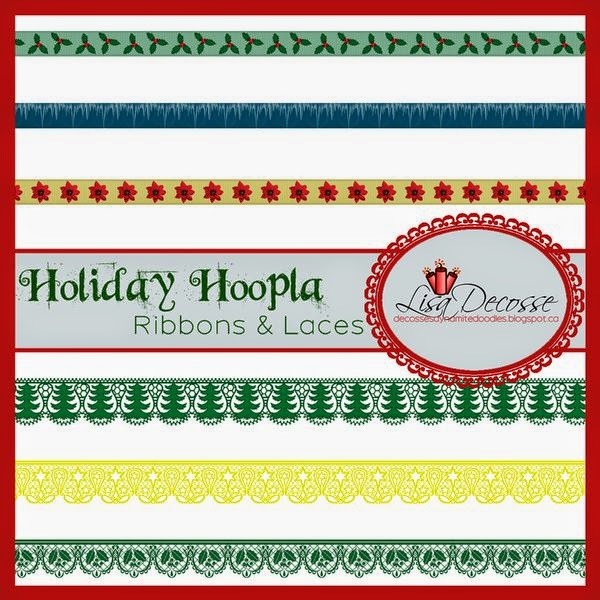 I had never used the distress ink to color a ribbon before so this was something new for me. Then I stamped the sentiment on it. It was CAS all the way. I am happy to announce that I have been chosen as one of the designers for a new card site. 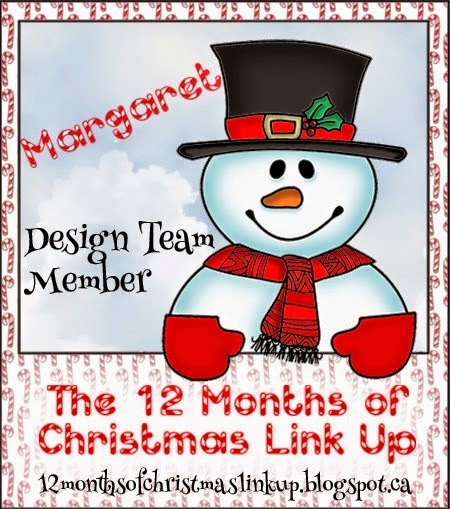 It is called The 12 Months of Christmas Link Up. It is just what it says, a Christmas only site. There will be a challenge each month to create a card hopefully using the owner's digital paper and a digi. There will be different sponsors each month, but you don't have to use one of their digis. So, come on over and check out the new site and join in. 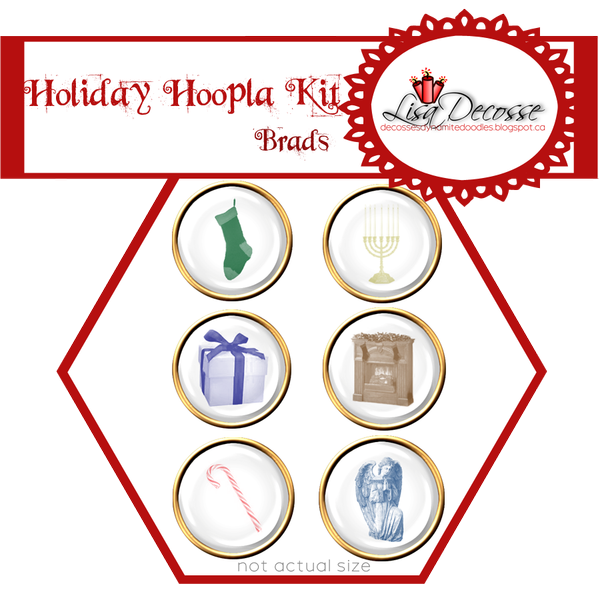 If you make a card each month, you will have a head start on Christmas 2015. I am looking forward to a long relationship with this DT as I love to make Christmas cards all year long. The blog is a new one which has grown out of Lisa's old one. Today is the crossover day. I created this card using the freebie digi paper Lisa provided and the image from Deedee's Digis Christmas Cardinal collection. Morning Peeps. It's Wednesday and time for Word Art Wednesday challenge. This challenge will go for two weeks because next Wednesday is Christmas Eve. The next challenge will be on December 31st. You can end the old year with a little challenge or start the new one. The Scripture verse for this week is Phillipians 1:6. The weather has been a little gloomy so I thought I would use some bright colors. The dp is Bo Bunny. Cardstock was in my scrap pile so no idea who makes it. The bling is from Want2Scrap. The first sponsor for this challenge is Deedee's Digis. If you have been following my blogs, you know I am madly in love with this site. I didn't use it for this card, but since I have quite a few of her collections now, you will see a lot more in the future. The second sponsor is the Flying Unicorn store. There's lots of good stuff and inspiration there. If it's Wednesday, this must be The Outlaws Sketch Challenge. We are still being sponsored by Ching-Chou Kuik. I chose to use "Dandelion Field" for my card this week. I used KaiserCraft 6 1/2 Violet Crush paper pad, Recollections cardstock and Neenah Solar White cardstock. I colored the image with Copics. The scalloped circles were cut with my Cameo. The butterfly is a die cut using a Martha Stewart die. Hey Peeps. It DS4J time again. Our hostess for this challenge is Riette and her theme is Celebrating Something New. Well, at this time of the year, it's nearly time for the New Year to make its appearance. So, with that in mind, I chose to use New Year Streamers. You can find it here in the store. I printed it and cut it with the Cameo. I also cut the layers with the Cameo. I combined Copics and Wink of Stella to color the streamers and stars. The bling is from Want2Scrap and colored with Copics to match the streamers. Morning Peeps. It's time for the Tuesday Throwdown challenge. This week is an easy theme -- Anything Goes for Christmas. So, if you enter, make sure you do a Christmas theme. Our sponsor for this challenge is Crafty Girl Creations. I chose to use "Ornaments with Dots" for my card. I used Recollections red cardstock for the card base, 6x6 pad called Bright Christmas for the first layer, Creative Imaginations for the green layer and Neenah solar white for the image. I colored the image using both Copics and Wink of Stella glitter pens. The snowflake design is imprinted on the dp. The bling is from Want2Scrap and I colored it with Copics. Morning Peeps. It's Sunday and time for the New Releases at DS4J. There are some great ones this week. So, pop on over and take a look after you leave me a comment. For my card, I used Ribbon Girl. The card base is Recollections. I cut the mat with my Cameo. I also used the print and cut feature to print and cut my image. It hen colored it with Copics. The sentiment die is from Stampin' Up. I popped the image with foam tape to give it a little dimension. Well, I made it to the end of the year and contributed all 12 months to the DigiStamps4Joy Christmas challenge. I have more than enough Christmas cards to send out. The digi for this month's challenge is one of the Three Kings. I used red and green cardstock from my stash. I used the print and cut feature on my Cameo to cut the image. Then I colored it with Wink of Setlla glitter pens. I used Pearl Pen Ice White on his beard. The star and wording are from a piece of gold metallic paper in my stash. The dots in the "i" are Want2Scrap pearl bling. Morning Peeps. It's Wednesday again and time for a new challenge at The Crafter's Café. It's getting closer to Christmas and I'm still making my Christmas cards. Oh well, I'll get them done soon. If not, there's always next year. I chose this image, Three Wise Men, from our sponsor for this challenge, Eureka. The card base is 5 1/2 x 5 1/2 cut from an 8 1/2 x 11 sheet of Recollections. The white panel is Neenah Solar white. I stamped the song words on a piece of white cardstock and heat embossed it with Recollections Snow embossing powder. I then sponged it with Tim Holtz Festive Berries Distress Ink and rubbed the excess of the embossed part with a Kleenex. The gold metallic (doesn't really show the metallic in the photo) behind the image is from a DCWV 6x6 metallic pad. I colored the image with Copics and Wink of Stella Glitter pens. To give a little dimension to the card, I popped the white layer, the gold shadow and the image with foam tape. The ribbon is from Celebrate It. Morning Peeps. 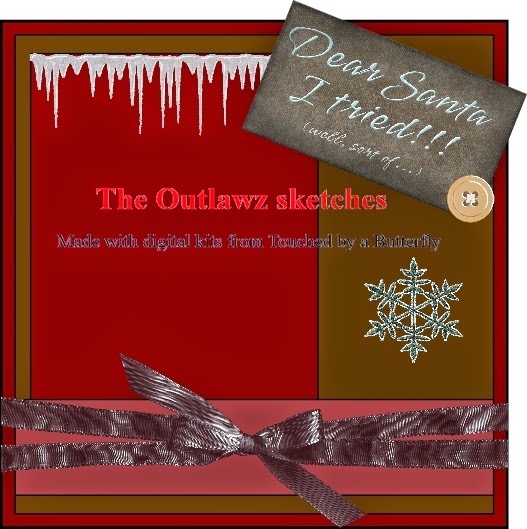 Once again it is time for a new sketch at The Outlawz. 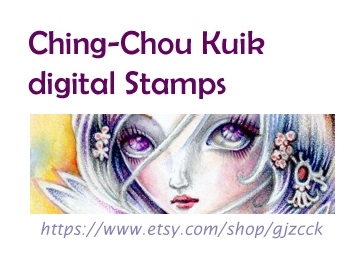 We are being sponsored all month by Ching-Chou Kuik. If you haven't had a chance yet to check out the awesome digis on the site, do it now. I made this card 5.5 inches square. 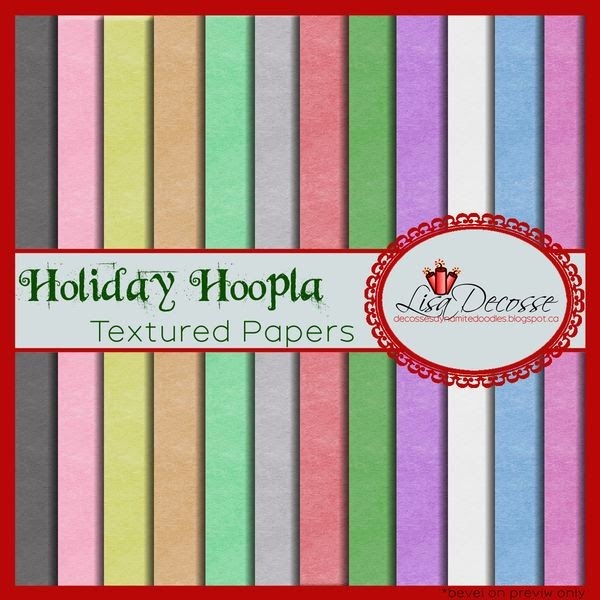 I used both Recollections and Stampin' Up cardstock. Flowers were in my stash and of unknown origin. Theribbon is from Really Reasonable Ribbon. I cut the image with my Cameo. This time, I didn't use an offset, but just cut around the outline of the image. I then colored the image with Copics and used some foam tape to mount it on the card. The tag is a Sizzix tag I have had for ages. The sentiment is from Technque Tuesday. Morning Peeps! It's time for my guest designer card at Word Art Wednesday again. I just love this site for challenges. They provide a Scripture verse to use, but it is not mandatory. If you have a nice verse you like better, you can use it. Hop on over there and see what kind of projects are done. The sponsors for this week are Crafty Ribbons and Freckled Fawn. I made the card 6x6 to show off both the Scripture passage and the Christmas Candle image from DS4J. It comes in both pre-colored and blank for you to color. 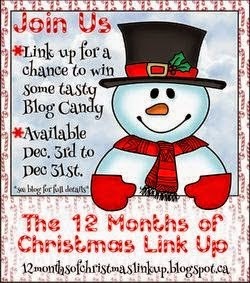 It's blog candy time so hurry on over to the 12 Months of Christmas blog for a chance to win prizes. We are offering up a total of 7 prizes. One person will receive the full mini kit. 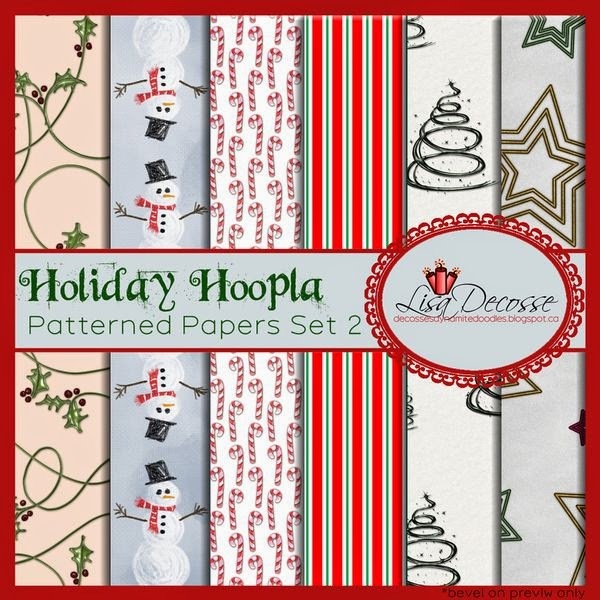 One person will receive both paper sets (patterned and textured). One person will receive the word art set. 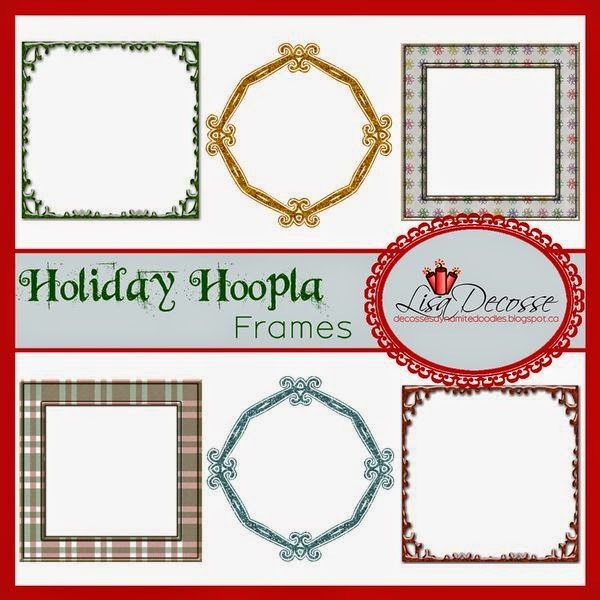 One person will receive all three element sets (frames, lace/ribbons, brads). One person will receive all twelve papers that were offered up during the 2014 season of the link up PLUS two bonus papers. 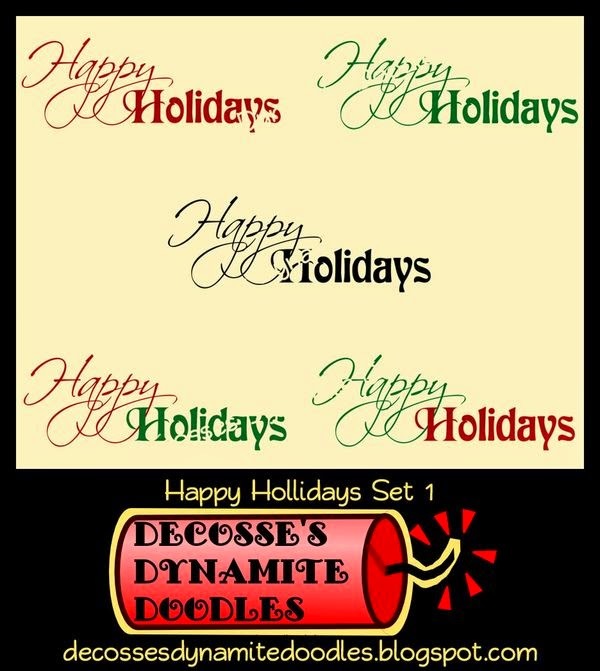 One person will receive the Happy Holidays word art set. 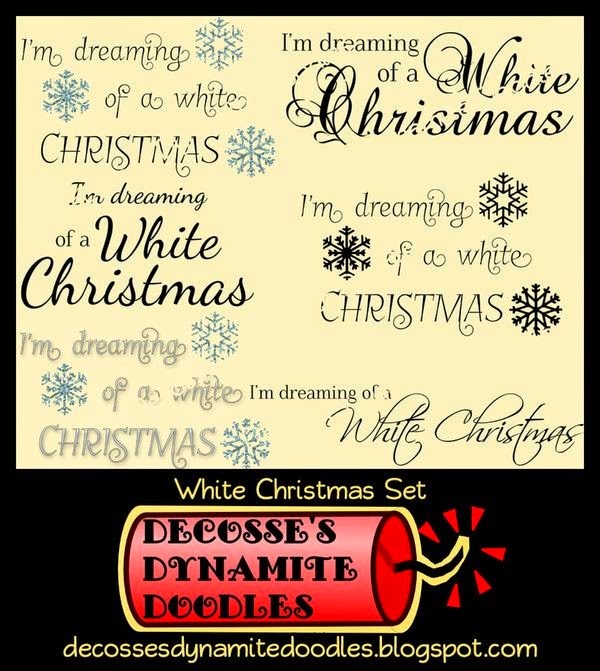 One person will receive the White Christmas word art set. Be or become a Follower of this blog through Google Friends Connect. Add the candy badge to your sidebar. Leave us a comment letting us know your favourite holiday tradition. Link up through the Inlinkz feature below. We will post the winners of the blog candy on Thursday, January 8th, at 6:00 PM. Morning Peeps! If it's Wednesday, it must be The Outlawz Sketch Challenge. We have some gorgeous images for your inspiration this month. Our sponsor is Ching Chou-Kuik. This is a new site to me, but oh wow, what fantastic images. The image I used for my card is called "Shih Tzu." I did a lot of the designing and actual cutting using my Cameo. Print and cut got me the image and then I cut two flower files for the accents. The image is colored with Copics. The dp is from a Bo Bunny 6x6 collection called "Enchanted Garden." The card base is Recollections White and the layers for the banners are also Recollections. Hey Peeps! Another entry for today is for the DS4J challenge. Challenge 105 is being hosted by DT Charlene. She has chosen Christmas as her theme for this challenge. I used Christmas Tree (3) from the shop for my card. The silver garland is colored with Wink of Stella silver glitter pen and the lettering and star with the Wink of Stella gold glitter pen. I colored the tree and tree stand with Copics. The red paper is Recollections as is the striped paper. Bling comes from Want2Scrap. I popped the tree with foam tape to give it a little more dimension. Be sure to check out the Word Art Wednesday challenge today as I have been chosen to be the GDT for the month of December. I will have a new card every Wednesday over there during the month of December. Morning Peeps. 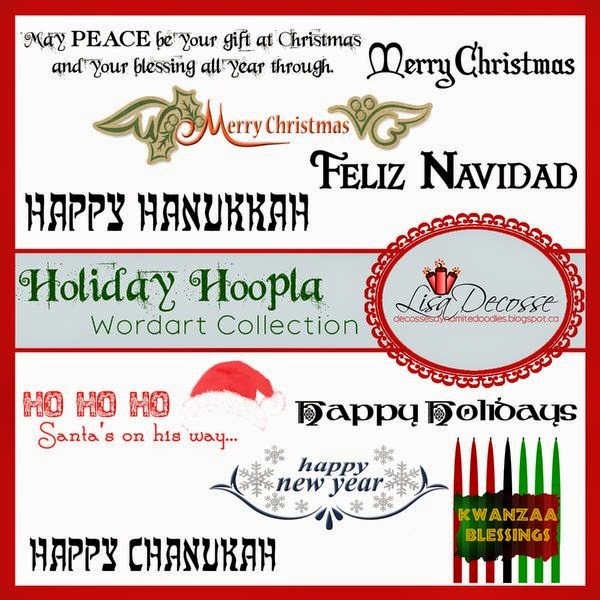 I am very happy and pleased to have been chosen to be the GDT for the month of December for Word Art Wednesday. If you are not familiar with it, it is a very Christian based blog. Hop on over and check it out. They provide a Scripture verse each week on Wednesday. You are free to make any design. Although you are not required to use the verse, it is a nice gesture to do so. I used a pre-colored image from Deedee's Digis Mary's Joy and printed it and the Word Art saying on white cardstock. I then cut it to 4 x 5. Cut a piece 4 1/4 x 5 1/4 and used my Silhouette Cameo to cut the oval opening. Then I layered it over the cardstock with the image. The snowflakes were cut with Sizzix Snowflakes #15 Sizzlits die. I used clear rhinestones and colored them with Copics BG13 and adhered them to the white ribbon and snowflake centers. I discovered yesterday that Deedee's digis has a blog. The challenge is a progressive one. It's called "Digi of the Month Challenge." Deedee also gives a free digi collection to get started. Then when you enter your card on the blog, you get the next month's free too. Otherwise, you pay $1.25 for it to be able to enter the challenge. This month's freebie is "Happy Brrr-Day." There are six images in both pre-colored and outline. I thought it would be fun to enter this challenge and build up my Deedee's Images at the same time. I used an outline image and colored it the way I wanted. I also paper pieced the bear's sweater with a dp from Recollections. The background layer is a digi paper from Digi Stamp Dreams called "Plaster." It looked like snowballs thrown at a wall so I resized it to 5 1/2" square and printed it out for this challenge. I printed and cut the image with my Silhouette Cameo and also grouped the sentiment. The snowflakes are a Silhouette file. (Did I ever mention that I am crazy about my Cameo?) Bling is from Want2Scrap. Morning Peeps. It's Tuesday and time for another challenge at Tuesday Throwdown. Our sponsor for this challenge is Robyn's Fetish. I am using Special Christmas Tree for my card. It took a lot longer to do than I had originally planned. I colored the tree with green Wink of Stella glitter pen. The various ornaments on the tree also use Wink of Stella glitter pens. I put each and every pearl bling separately onto the tree. I also used Liquid Pearls for some of the bling. The white pearls and flourishes are from Want2Scrap. The dp is from Recollections Bright Christmas 6x6 pad. I have joined the Freebie/Progressive Challenge at The Outlawz. It's similar to the Christmas card challenges I have been doing with DS4J and Lady Anne this year. Only the Outlawz is not just Christmas. Once you sign up and use the free digi provided, you will receive a new digi each month. Make your card and post it on The Outlawz challenge. Simple. The only catch is you MUST use the digi provided and if you don't enter a month, you will not receive the next freebie. The sponsor for this first challenge is Simply Betty Stamps. The sponsor provided the image for the DT and the participants to use. It looked to me like a cross between Christmas and Halloween so I decided to make it non-traditional Christmas colors. I designed the card on my Silhouette Cameo. Then I printed and cut the pieces. The image is colored with a combination of Wink of Stella glitter pens and Copics. The brown cardstock is Stampin' Up Soft Suede. 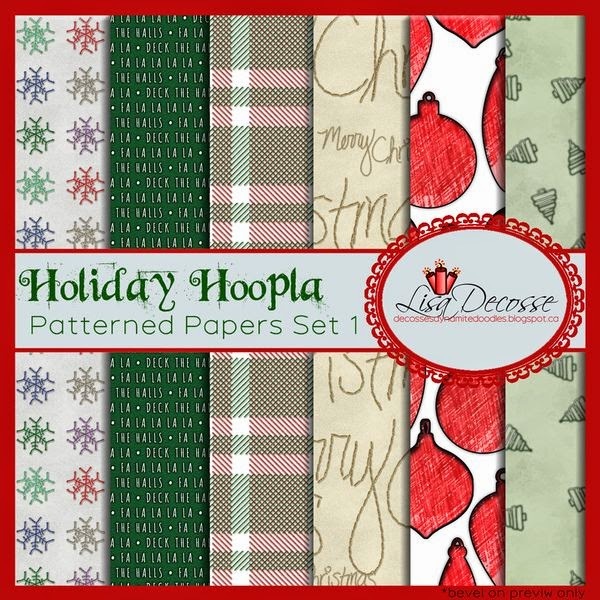 The printed paper is a digi from Gina K Neopolitan set. The edging is cut with a Martha Stewart edge punch. Ribbon is from American Crafts. Flower is Prima and bling is from Want2Scrap. I used a sketch from Michelle Steward at Atlantic Hearts Sketch Challenge. A good Sunday morning to all my Peeps. There is a new release of images over at DigiStamps4Joy. Check out the online store to see all the newest images available. What little girl didn't have a rag doll. I know I did when I was growing up in the stone age. I remember she had a purple and white striped dress. I thought I would make my card this week and dedicate it to my rag doll. I colored her with Copics. Her heart was colored with Wink of Stella red glitter pen. The background is a Silhouette file. Flowers are Prima and bling is Want2Scrap. Morning Peeps! These weeks are flying by way too fast. I can't believe that it is only 23 days till Christmas. It's time to prepare for saying thank you for all those gifts you will be getting. The Crafter's Café challenge blog has the theme of "Thank You" for this week. I used "Say What Snowman" from our sponsor Oak Pond Creations. I added a thank you sentiment to the banner he is holding. There is also a second sponsor this week, Sassy Studio Designs. Why not hop over and check out both sponsors. Morning Peeps. Tomorrow is Thanksgiving in the U.S. Hope you all have a very happy day with lots of food, family and fellowship. Once again, it's time for the Wednesday sketch challenge at The Outlawz. While you are waiting for the turkey to be done, why not just create a card for this challenge. This is the final week for our sponsor for this month, Deedee's Digis. Hope you have had a chance to check out the great digis at that site. The one I chose for this week is from "Happy Owlidays." It is a precolored image. This is what you get in the set. Check it out. I used the pre-colored image from the collection and printed and cut it on my Cameo. The dp are from various 6x6 paper pads I have collected over the years. The ribbon is from Celebrate It (Michael's brand). The snowflake is the last of the glittered snowflakes from a package I bought a couple years ago.